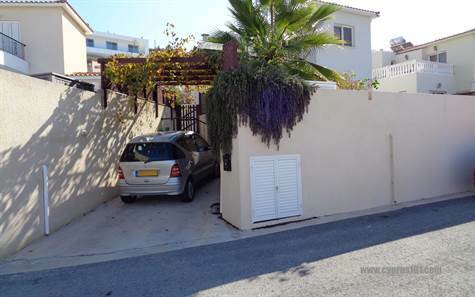 Peyia, Paphos - Situated in a quiet cul-de-sac in the popular area of Lower Peyia, this stylish 3 bedroom detached villa is contemporary in design and in excellent condition with good quality modern finishes. The light and airy living accommodation on the ground floor is split level with a guest cloakroom, spacious lounge and dining area on the lower level and a huge impressive kitchen a few small steps above. Patio doors from the living room provide easy access to a covered veranda and pergola area overlooking the swimming pool and lovely landscaped gardens. The kitchen is a chef’s paradise with loads of cupboard and worktop space. The fitted units are white, the worktops black granite and included is a fridge/freezer, built-in oven, gas hob, dishwasher and washing machine. To the rear of the kitchen is direct access to the side garden and to left of this, a marble staircase leading up to three double bedrooms, all with fitted wardrobes. The master bedroom is particularly spacious and has an en-suite shower room. The second bedroom has a private balcony with lovely views and there is a family size bathroom accessed directly from the landing. An added bonus is the enormous roof terrace which has a built-in barbecue, cupboards and sink. The views all around are absolutely stunning with coastal views on the one side and amazing mountain views on the other - a wonderful place to sit and watch the beautiful sunsets. Perfect as a holiday home or permanent residence, this delightful property comes fully furnished and has title deeds available. 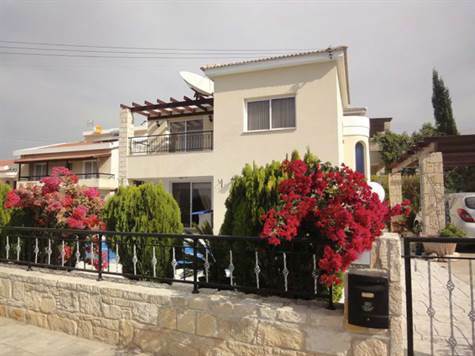 Tsada, Paphos - This spacious 2 bedroom detached villa is situated in a quiet residential cul-de-sac of properties between the traditional Cypriot village of Tsada and Paphos Town. Both are a 5 minute drive away. The property was originally built as a 3 bedroom, with a bedroom downstairs and two bedrooms upstairs. However, the current owners redesigned the accommodation using the downstairs bedroom as the kitchen, making the living room more spacious. The property however, could easily be converted back to a 3 bedroom if required. The accommodation features an entrance hallway with fitted cupboards and marble staircase to the first floor. To the right is a large archway leading to a spacious living room with feature fireplace and wood burner fire. Patio doors provide easy access to the outside veranda and swimming pool terrace. To the left of the hallway is a good size kitchen with plenty of cupboards and worktop space, built-in oven, electric hob and extractor fan. Next to this, also off the hallway, is a shower room with modern finishes. On the first floor are two double size bedrooms, both with fitted wardrobes. The master bedroom, being the largest, has a modern en-suite bathroom and patio doors to a large balcony with stunning sea and mountains views. A second shower room is accessed directly off the landing. The outside space has been designed with low maintenance in mind and the swimming pool, although not currently in use, has had a new liner fitted. The property is suitable as a permanent residence or holiday home and has full title deeds. 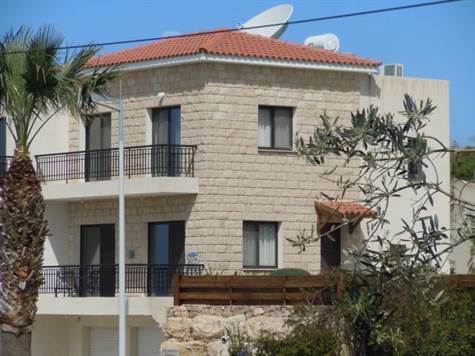 Tala, Paphos - This well presented 3 bedroom detached villa is situated in the popular village of Tala, on the road to St Neophytos Monastery. Tala has a good range of local amenities including a traditional village square with restaurants, tavernas and coffee shops. The ground floor features a good size fully fitted kitchen, spacious dining area, separate lounge and guest cloakroom. Windows on all sides provide lots of light and there is easy access to an L-shaped balcony with lovely sea views. Upstairs are three double size bedrooms with plenty of fitted wardrobes. The master bedroom has an en-suite shower room and private balcony with stunning sea views. The second bedroom also has it's own balcony and a family size bathroom is accessed directly from the landing. An added bonus is a huge basement which can be used for storage/parking or converted into additional accommodation. To the side is a designated store room. The swimming pool is shared by the project of 8 villas and is accessed via stone arches. It’s very near to walk and yet far enough away not to be bothered by any potential noise. The property is fully furnished and has full title deeds. Please refer to MLS#: 1410 when inquiring. 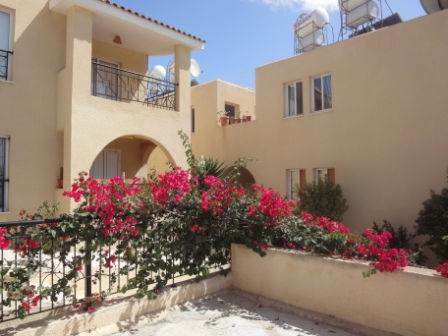 Peyia, Paphos - This luxury 2 bedroom townhouse is located in the popular village of Peyia. There is a wide range of local amenities nearby and Coral Bay, known for it’s sandy beaches and crystal clear waters, is only a few minute’s drive away. The property has been finished to an excellent standard using top quality finishes, including stone, graphiata, granite and wood. It has many extras such as air conditioning, ceiling fans, double glazing, fly screens, pressurised water, solar panels and much more. On the ground floor is a spacious living area with comfortable lounge, dining space, a shower room and end kitchen with breakfast bar. The kitchen has granite worktops and is well equipped with quality appliances including washing machine, fridge/freezer, built-in oven, electric hob and extractor fan. Patio doors off the lounge provide easy access to a large terrace with amazing views of the mountains to the front and gorgeous sea views to the side. The swimming pool area situated to one side of the project is well maintained and has shower and toilet facilities. There is an allocated covered parking space near the entrance. This property is very impressive and has lots to offer, both as a permanent home or holiday residence. It comes fully furnished and has full title deeds. Please refer to MLS# 1045 when inquiring. 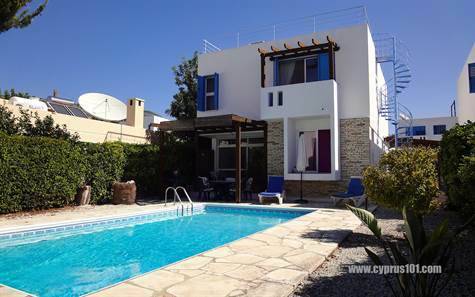 Tala, Paphos - This modern custom built villa is ideally located within easy walking distance to the popular traditional village square of Tala. The ground floor features very spacious accommodation including lounge, dining area, fully fitted kitchen, double bedroom and modern bathroom. A covered veranda which runs the width of the property is ideal for outdoor dining and can be easily accessed via patio windows from all rooms. On the first floor are three spacious double bedrooms. The master bedroom has a stylish wet room and almost wall to wall patio windows designed to take full advantage of the fabulous views and sunsets. A large bathroom with bath and separate shower is accessed directly from the landing. The property has been designed to enjoy the stunning panoramic sea and countryside views from both the lower level and from the large decking area above. It is ideal as a permanent residence or holiday home and has title deeds. The finishes are good quality and include double glazing, marble staircase, granite worktops, fitted wardrobes, italian finish architraves and doors, provision for central heating and air conditioning, decorative stonework, swimming pool with roman steps and tiled pool shower. All is needed is the finishing touches to create the perfect family home. Please refer to MLS#: 1084 when inquiring. 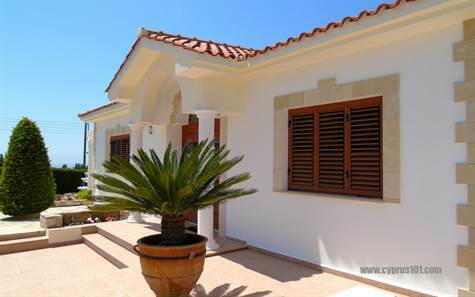 Peyia, Paphos - This well presented 3 bedroom detached villa is situated in the sought after area of Lower Peyia, a few minute’s drive from the popular holiday resort of Coral Bay. The ground floor features a light & airy living room with spacious lounge, dining area and well equipped kitchen. A hallway leads to a utility room, good size double bedroom with fitted wardrobes and a large shower room. A marble staircase leads up to a large landing with alcove space, ideal for use as an office or kitchenette. Patio doors from here provide easy access to a huge balcony with stunning mountain views on the one side and lovely sea views on the other. The balcony can also be accessed directly from the two upstairs double bedrooms. The master has en-suite facilities and a large family bathroom with useful tall cupboard is accessed directly from the landing. The property is extremely well maintained by the current owners and has good quality finishes throughout. Being a permanent home, every detail has been thought of and there are many extras including double glazing, air conditioning, fly screens, gas central heating, ceiling fans, security alarm, granite and marble finishes and much more. The outside space is peaceful and charming with a covered terrace and pergola overlooking the 10 x 5 swimming pool and surrounding mature landscaped gardens. There is a useful store room/workshop nicely tucked away in one corner and a further large terrace to the side of the property. The property is perfect as a permanent residence or holiday home and has full title deeds. Please refer to MLS#: 1101 when inquiring. Kouklia, Paphos, Cyprus - This semi-detached stone finished villa is located within easy walking distance to the charming traditional village of Kouklia. In addition to having the essential local amenities and a good variety of Cypriot tavernas, Kouklia is a haven for golf enthusiasts, being situated on the East side of Paphos and a short drive away from 3 quality golf courses - Aphrodite Hills, Secret Valley and Elea. The villa is part of a peaceful luxury project and has been finished to an exceptional standard. To the side of the property are stunning communal facilities shared with only two other properties. These include a swimming pool with graduated slope for easy access, built-in jacuzzi and tiled pool shower to the side, plus a corner dining and entertainment space with fitted barbecue. The accommodation includes a spacious open plan living room with gas fire, dining area, kitchen with solid wood units, cloakroom, three double size bedrooms with fitted wardrobes and a family size bathroom. There is a balcony access from the living room and two of the above bedrooms, from where wonderful coastal and rural views can be enjoyed. The property also benefits from a private driveway and large garage with automatic doors and space for one car plus a workshop to the side. There is certainly potential to use this space as further guest accommodation if required. The property is furnished to a high standard and is ideal as a luxury lock up and go holiday home, or indeed as a permanent residence. There are full title deeds. Please refer to MLS#: 1425 when inquiring. 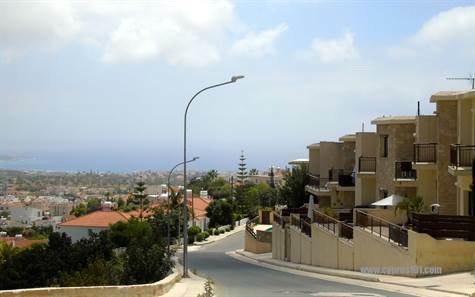 Kato Paphos, Paphos - This modern first floor apartment is situated on a well maintained project in the Kato Paphos area. Both Paphos Town and the touristic amenities of Kato Paphos are a 30 minute walk away, or you can hop on a bus which run every 10 minutes from the bus stop near the complex. The property is semi-detached and part of a small block of 6 apartments nicely tucked away and set back from the main communal areas. The accommodation features a spacious open plan living area including lounge, dining area and kitchen. The kitchen is well equipped with built-in oven, electric hob and extractor fan, fridge/freezer and washing machine. Patio doors from the lounge open on to a wonderfully private L-shaped courtyard garden - perfect for outdoor dining and relaxing. A hallway off the living room leads to two double size bedrooms with fitted wardrobes and a bathroom with newly fitted modern shower cubicle. The complex has two large swimming pools to choose from, both very well maintained with plenty of space for relaxing and sunbathing. The gardens are beautifully landscaped. 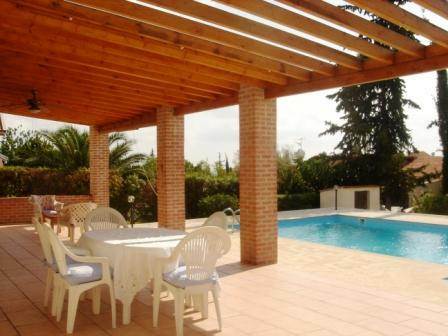 The property is ideal as a holiday home or permanent residence. It has full title deeds and is fully furnished. Please refer to MLS# 1060 when inquiring. Konia, Paphos - This impressive custom built home is situated in a quiet residential area within walking distance to the local shops and tavernas of Konia. Konia is a popular village well known for it’s luxury property and prestigious location, being only a few minute’s drive away from Paphos and the coast. The property features a luxury bungalow approximately 145 sqm in size, plus two studio apartments. One studio, situated to the rear of the leisure area and pool terrace, is ideal for maid’s or guest accommodation. The second studio has it’s own private entrance and driveway - perfect as rental accommodation or for those wanting office space separate to the main home. The bungalow is extremely spacious and well designed with good quality finishes. The accommodation includes an entrance hall, large living room, guest cloakroom, kitchen with fitted oak units and granite worktops, dining room, utility room, study, master suite with en-suite bathroom and walk-in closet, 2 double size bedrooms with fitted wardrobes and a second bathroom with jacuzzi corner bath. The outside space is a delight with beautifully landscaped gardens including a marvelous water fountain. Designed with low maintenance in mind there are a variety of terraces from where you can appreciate the lovely sea views and a purpose built entertainment and dining space to enjoy the wonderful outdoor life. 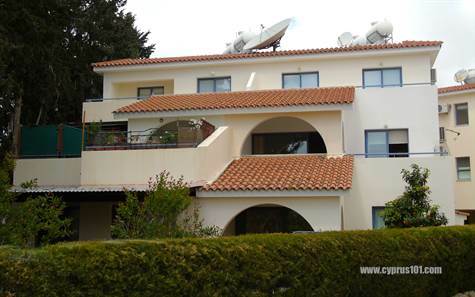 This well maintained quality home is certainly very unique and is suitable as a permanent residence or holiday home. There are title deeds and furniture, white goods, blinds and curtains are included. 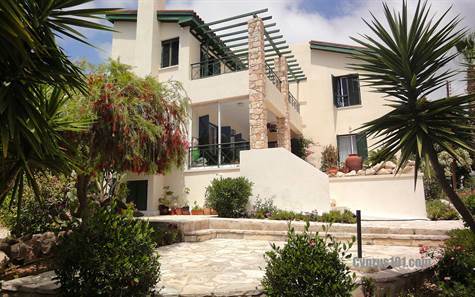 Tala, Paphos - This impressive 3 bedroom villa is located in a mature, quiet, residential cul-de-sac. Tala village with its many shops, tavernas, bank and bus stop are within easy walking distance. The property was originally built in 1982 and modernized by the current owners in 2003. An attractive stone archway frames the front entrance of the property and leads to a covered front porch and inner hallway. From this hallway you can see right through to the stunning veranda and pool area through a serious of archways. All the rooms are spacious and comprise a fully fitted dining kitchen, lounge with fireplace and wood paneled ceiling leading through to a second large sitting room, three double size bedrooms all with plenty of storage space, and two well fitted shower rooms with quality finishes. Other features include good quality laminated flooring throughout the bungalow with tiled floors in the kitchen and shower rooms and tinted windows. Patio doors lead from the sitting room to the impressive covered veranda and mature private garden. The large swimming pool with attractive corner steps, has recently been fitted with a new tiled effect liner. An additional feature of this property is the separate Annex with veranda, which can easily be converted to use as a fourth bedroom, guest/staff accommodation or a workshop/studio. The driveway can easily accommodate four cars and there is plenty of room to add a garage if required. Please refer to MLS#: 1152 when inquiring. 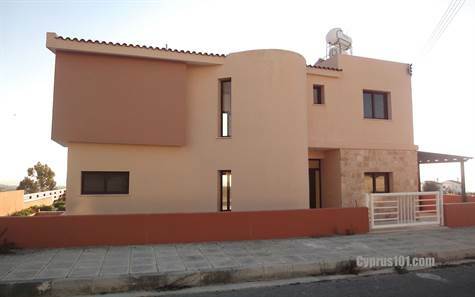 Emba, Paphos - This impressive 3 bedroom detached villa is situated in a quiet residential area in a rural location between the villages of Emba and Chloraka and is within easy walking distance to local amenities. Paphos is approximately 5 minutes drive. The property is in excellent condition and has good quality finishes throughout. The ground floor features a very spacious open plan living room including a comfortable lounge, formal dining area, modern kitchen and guest cloakroom. Patio doors in both the lounge and dining area open on to the private swimming pool terrace. The kitchen is well equipped with white fitted units, granite worktops, built-in oven, gas hob, stainless steel cooker hood, fridge/freezer, dishwasher and washing machine. An impressive staircase with arched windows leads up to the first floor. Here there are three double size bedrooms, all with fitted wardrobes. The master bedroom is extremely spacious and has an en-suite shower room. Off the landing is a family size bathroom with built-in storage cupboard including a laundry shoot to the ground floor. Both the master and second bedroom have patio doors providing easy access to a covered balcony with gorgeous rural views and the sea beyond. The plot is beautifully landscaped with a variety of colourful shrubs and fruit trees. There are two separate covered terraces ideal for outdoor dining and relaxing, the first overlooking the pool and the second to the side of the property directly off the kitchen. 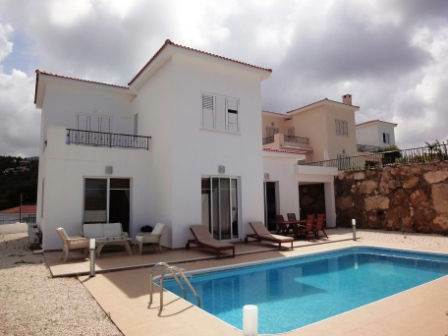 The property is ideal as a permanent or holiday home and there are full title deeds. 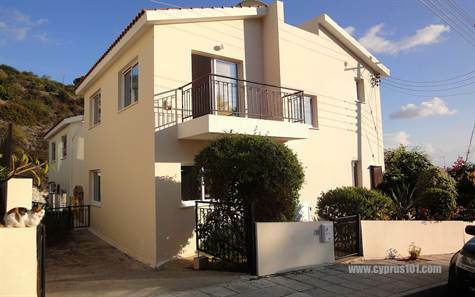 Chlorakas, Paphos, CYPRUS - This 3 bedroom, 3 bathroom semi-detached townhouse is situated in the popular area of Chloraka, close to the many amenities of Paphos. The property sits in a sizeable plot of 780sqm which is largely landscaped with a wonderful variety of colourful, local plants. The covered veranda at ground level overlooks a lower terrace and the beautiful gardens below where there is space for a swimming pool if required. An artist's impression of how the space can be used for a swimming pool is included.